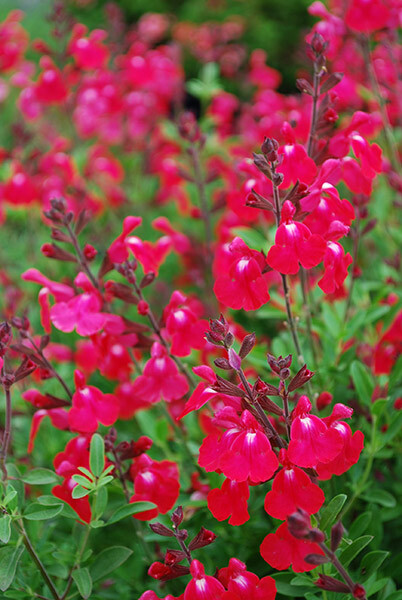 These perennial salvias are part of a large family native to Mexico and is therefore well equipped to survive the often dry conditions in Australia. They offer a lengthy flowering period first beginning during spring. They can be easily grown in containers for mobile colour if required. Triming spent flower stems not only encourages further flower production but also helps maintain a compact form with dense evergreen foliage which is characteristically aromatic. There are over 500 known salvias in the world ranging from bedding plants and perennials to small shrubs. The plant Salvia greggii is native to the hot, dry regions of Mexico and Texas. Prefers a warm, sunny and well drained position in the garden and will tolerate dry conditions quite well. However, like most plants it will provide you with an even better display given a little love and attention. This means giving it a deep watering during extended dry periods and after flowering prune off up to one third of the plants original size and feed with a slow release fertiliser. A few additional light prunings through the warmer months will also encourage and promote futher flowering. Will tolerate light frosts. An attractive plant for the middle of a sunny perennial border or planted in shrubberies where they will provide lasting colour over a long period during spring, summer and autumn. Also plant among herb borders where the aromatic foliage contributes a delicate fragrance if brushed against.